2006 Prize: Harold F. Dvorak, M.D. 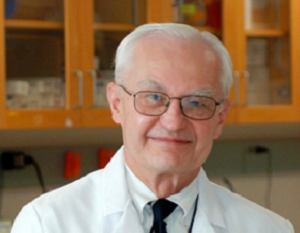 The Albert Szent-Györgyi Prize Committee selected Dr. Dvorak for his breakthrough discovery of the vascular permeability factor/vascular endothelial cell growth factor (VPF/VEGF). His contribution has led to a series of discoveries which both elucidated the mechanisms of angiogenesis as well as the development of antibodies and small molecule therapeutics to inhibit VEGF. Today, anti-angiogenesis drugs have received FDA approval in the U.S. and 27 other countries for cancer treatments and other diseases. Largely because of Dr. Dvorak’s research, the possibility of anti-angiogenic therapy is now on a firm scientific foundation, not only in the treatment of cancer, but of many non-neoplastic diseases as well. Dr. Dvorak is the author of over 200 original peer-reviewed papers. In addition to his distinguished accomplishments in research, Dr. Dvorak is an NFCR Fellow and past President of the American Society for Investigative Pathology. Educated at Princeton and Harvard Medical School, Dr. Dvorak finished his residency in pathology at Massachusetts General Hospital and performed his postdoctoral research at the National Institutes of Health. He has served on the Harvard Medical School faculty since 1967 and for 16 years, chaired the Department of Pathology at Beth Israel Deaconess Medical Center. Your ticket for the: 2006 Prize: Harold F. Dvorak, M.D.